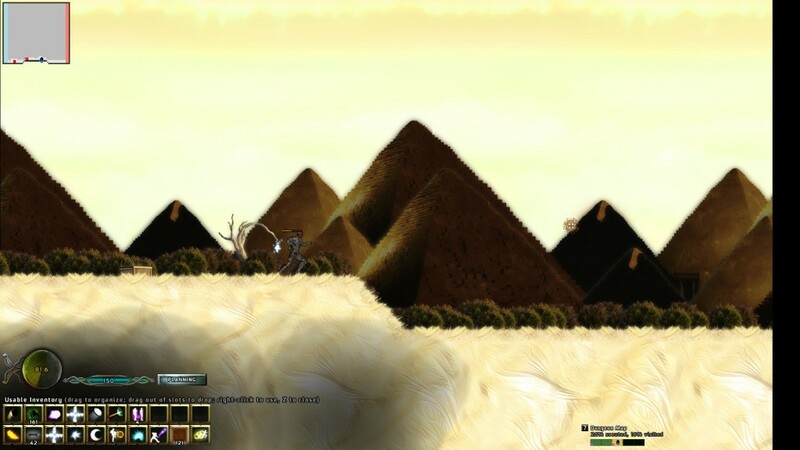 A Valley Without Wind, created by Arcen Games, is an action platformer with an emphasis on exploration and collection that possesses deceptively deep RPG elements. It’s difficult to nail down exactly what genre AVWW falls under as it incorporates some of the most solid mechanics from some of best games ever made. A Valley Without Wind is one part Super Metroid, one part Trine and one part Terraria. You begin by selecting an avatar to play as for the time being, the game is quick to let you know not to agonize over the decision because it is only a matter of time before your character will die and you will have to choose another to take their place as the new “Glyphbearer”. When you begin you have very few abilities at your disposal and basically no indication of what the story is or what your objectives are. 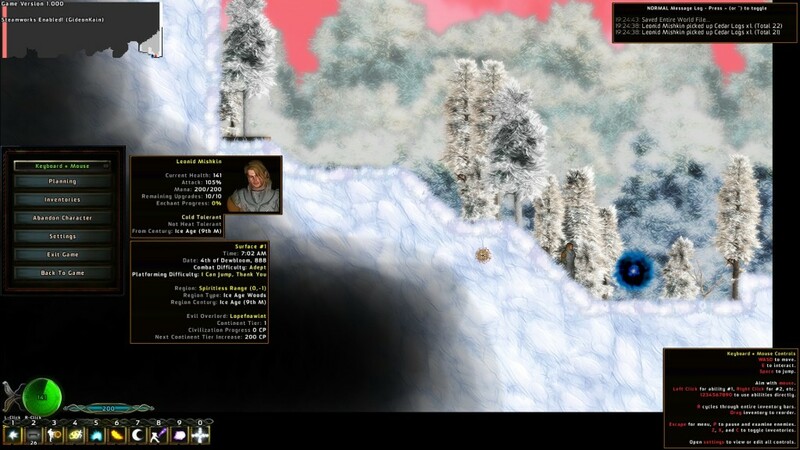 You can run, jump and cast basic spells as you explore a frozen alpine wilderness. The controls are surprisingly excellent for a Keyboard & Mouse game. There is some rudimentary gamepad support but due to the large amount of actions your character can perform (namely the full quickbar of spells) it’s an inferior control scheme. Your character jumps and falls with a satisfying arc that allows you to time jumps and adjust landings on the fly with confidence. You can attack every tree, rock and bush in the world to harvest their raw materials, you can explore modern and futuristic buildings gone to ruin to collect ingredients for things you have yet to discover and basically just have fun killing monsters and picking up items. The environments in A Valley Without Wind are procedurally generated. 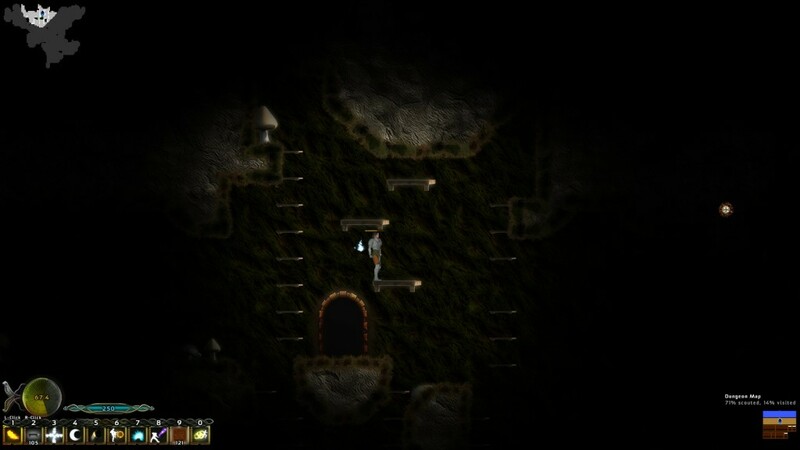 This means for every door you enter a new completely unique area is generated on the other side which may further link to several more areas. Each one is almost always well constructed and believable, if a bit sterile. Monsters of various elemental alignments inhabit these places aswell as a plethora of collectable items which feed into crafting and character progression. After a few minutes (or hours depending upon how many caves and buildings you decide to explore) you will stumble accross your first settlement where a scant selection of people will begin to help you flesh out the premise of the game. You are the survivor of some sort of cataclysm and the world is a foreboding place. As the “Glyphbearer” you are the protector of the remnants of civilized society. Your job is to journey across the world and explore it’s nooks and crannies discovering along the way a dizzying amount of strangely named items that will eventually feed into empowering your character, creating new spells to tackle the heavily elementally aligned monstrocities and basically, get this, just have fun?! At anytime you can choose to enter the last stage of the game, though it’s excessive challenge will likely keep you at bay until you’ve upgraded and acquired more powerful spells and developed your character. It’s this type of open world freedom that I thought was the most impressive feature in the game. A grid based overworld map allows you to select any of dozens of areas of one of several different types of biome. Alpine Forests, Deserts, Scrapyards, Abandoned Towns, Acid filled Caverns, the amount of different “texture sets” does an excellent job of fleshing out the world and adding variety and believability, and the fact that each area is randomly generated while still managing to look consistent and well planned is an impressive feat. The world of A Valley Without Wind is seemingly without a limit to it’s scope, you can enter an area and discover that it spans for what seems like miles or it may have a door right next to where you entered from, it’s up to you to decide how you want to navigate it, though it can be daunting to see “Stairwell #40″ as the title of the next area beyond a door. For some inexplicable reason when you are outside of a building, cavern or dungeon your planks and crates are affected by gravity and fall to the earth as soon as they are spawned. But, when you are “inside” they will be suspended wherever you choose to place them, allowing you to create your own vertical paths through an area. The ability to magically summon a platform that stays suspended in the air gives you a true sense of freedom because nothing is out of your reach, rather than having to backtrack or find another way to reach a high cliff edge, you can simply leap into the air, summon a platform beneath you, land on it and then repeat as necessary. It is also a nice touch that you can place crates and planks in bodies of acidic liquid, and they will float to the surface creating a bridge for you to cross the otherwise deadly hazard. 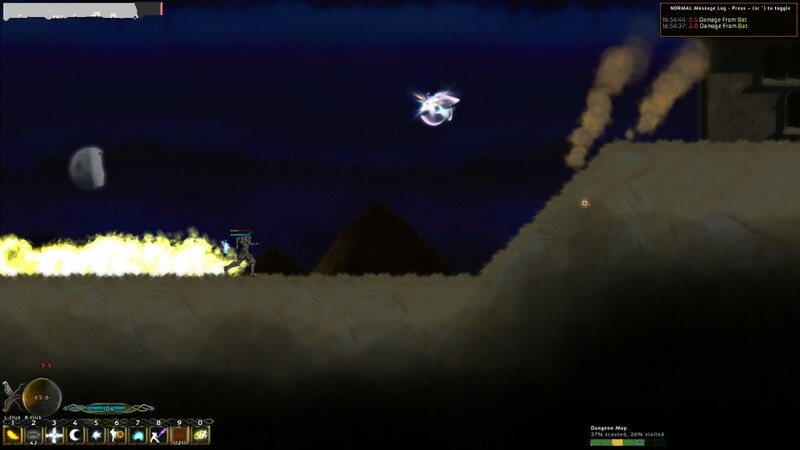 One of the first abilities you gain in AVWW is a super-speed run which causes a trail of flames to follow in your wake, the ability functions almost identically to the Super Metroid Speed Booster upgrade with the notable difference that AVWW’s ability can be activated instantly with a double tap of either left or right, there is no need to pick up speed first. It is a tremendously satisfying ability that allows you to make massive leaps and cover ground very quickly. It’s only caveat is that you take increased damage while the ability is active. 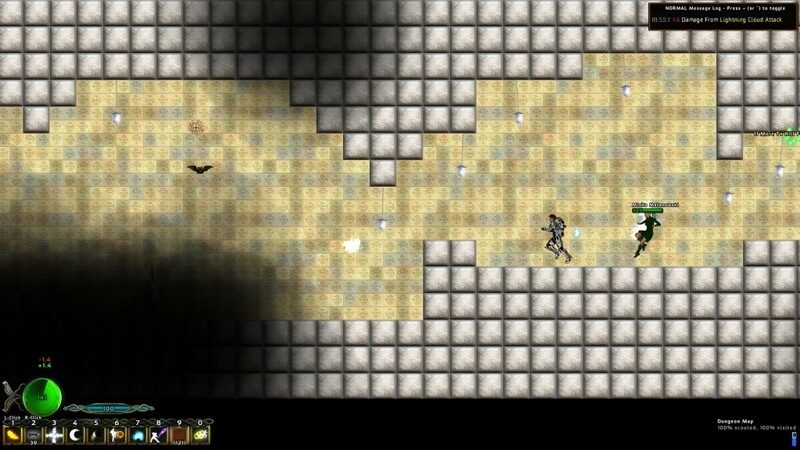 A Valley Without Wind is a very ambitious game, but it can also be very obtuse. A Valley Without Wind is a very ambitious game, but it can also be very obtuse. There is a stunning amount of information available to you from details about Villagers to half screen sized blocks of text describing how crafting and warp areas work to seemingly endless descriptions about items and where they can be found. It can be very intimidating to have 78 Lesser Gems of Conscience and not know what to do with them. There are numerous popup hints, which while a bit long winded, will give you clear descriptions of what you need to know in order to be able to understand and appreciate what is going on around you. A Valley Without Wind is one of the most unique games I have ever played. A Valley Without Wind is one of the most unique games I have ever played. It’s ability to combine excellent navigation and combat coupled with unrivaled levels of exploration in a 2D environment make it incredibly entertaining and a spectacle to behold. However, it’s relatively bland enemies and slow progression can become a drain on the experience as you’ll begin to take less and less opportunities to explore, say, a dilapidated yurt because unbenounced to you that deceptively small looking structure is actually a labyrinthine complex of a dozen different floors where each door may lead you deeper and deeper into a maze of rooms that serves no functional purpose. Despite a few cosmetic shortcomings and some pacing issues, AVWW will provide you with hours and hours of fun. Once you begin to wrap your mind around all the different abilities and spells at your disposal you’ll begin to tackle the world around you with confidence. 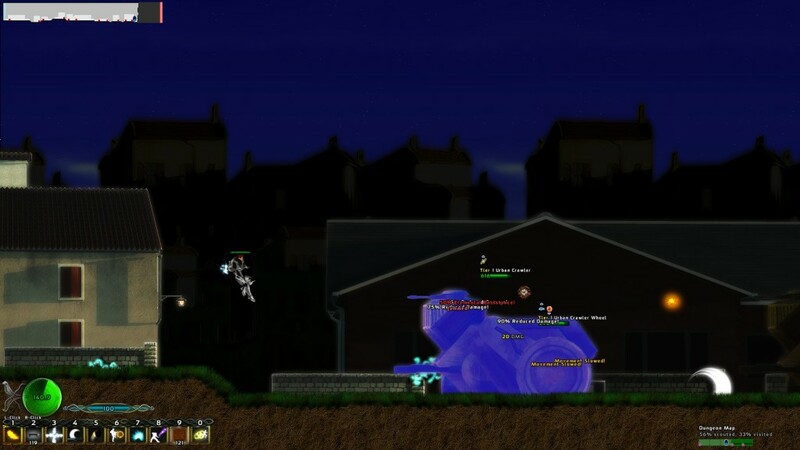 You’ll clear out three structures on the way to a boss tower in a few minutes, becoming very adept at maneuvering yourself around while calculating where to shoot and what to shoot to be most effective. I would recommend this game to anyone who enjoyed 16-bit platformers or fans of exploring generated worlds like Terraria or Minecraft. AVWW has fully customizable keybindings. I ended up making [Q],[W] and [E] all alternate keys for numbers 4-6 on the quick bar, this way I could easily cast multiple spells from multiple elemental schools in rapid succession.